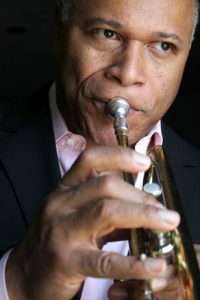 The Byron Stripling Quartet featuring Bobby Floyd will play two shows (7:30 and 9:30) Friday night at the Wexner Center. Presented in conjunction with the Wex’s ongoing Blues for Smoke exhibit, these performances will allow Stripling, an accomplished trumpeter/vocalist as well as the artistic director of the Columbus Jazz Orchestra, to examine the blues roots of jazz while also revisiting some of the earliest roots and inspirations of his own career. The varied program will include material from bop trumpeter/composer heroes like Lee Morgan and Kenny Dorham as well as Stripling’s vocal takes on jazz and blues archetypes. Accompanying Stripling and organist Floyd will be Dan Faehnle on guitar and Jeff Hamilton on drums, who will be featured again on a local stage on Monday. Further details and ticket information are available here.